Quick question: which automaker is responsible for the first mass-produced carbon fiber wheels? The correct answer, perhaps surprisingly, is Ford. Yes, Ford has almost quite literally reinvented the wheel, and all for the benefit of its amazing Shelby GT350R Mustang. 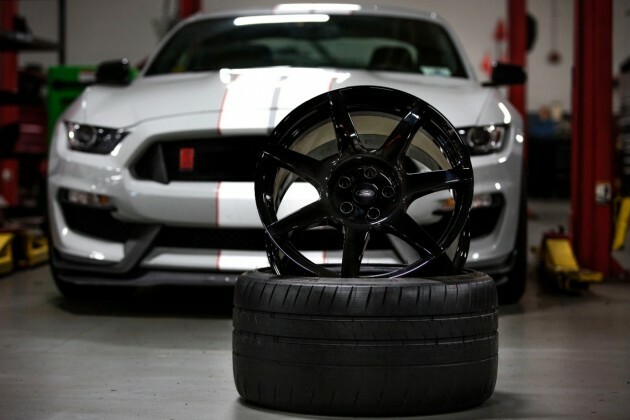 Ford will be the first automaker to produce carbon fiber wheels at a high volume, teaming with Australian supplier Carbon Revolution to create wheels for the all-new Shelby GT350R. Carbon fiber is unique in that it helps lower curb weight without sacrificing durability, and equipping the track-minded Mustang with carbon fiber wheels makes Ford the first automaker apart from Koenigsegg to offer them as standard equipment. Ford also utilizes carbon fiber to great effect in its new GT supercar, which will be released sometime next year. Ford is also teaming with DowAksa in the effort of discovering ways to make carbon fiber more affordable and thus more scalable for other components in mass-produced vehicles. Related Story: New Ford GT Wins EyesOn Design Award, Makes Forza 6 Cover, and More!